Attended the RM drop in for the secondary ICT co-ordinators in SLC. Really interesting afternoon, Trying to learn quickly just now for the new ICT aspects of my remit, so the drop in was really useful. Hope to attend more in future and will think more about how this kind of update/info could be extended in some way for others. The offices where I work were part of a cc4 upgrade during the week by RM as we are attached to a primary school.Brian K from RM was a star in the face of our demands from the area and extended team offices – the school upgrade was easy in comparison to us! Anyway lots of nice new features in the upgrade which can be seen here . Its currently being rolled out across SLC primaries by the summer – at the moment 50 primaries have already been upgraded – at its height 8 schools a week will be being upgraded – quite a feat for RM and the authority’s IT team who are also heavily involved in the primary schools modernisation programme too with a lot of movement over the summer in particular. Trinity High will have their official opening in the Camglen area this Monday coming. The Glow team and ICT folks here are working away with them for some interesting things at the opening on Monday! This week I attended the official opening of Burgh Primary and just loved the performances by the children – wee p1s with their teddy bears stole the show! Fantastic stuff. The plaque was unveiled by Councillor Pam Cleary who had attended the Burgh when she was at school – she put into perspective really nicely just what great opportunities the children in our schools are offered by the learning environments which are being built for them, but also reminded us that its not just about the building its about the staff and community within it – thats what makes the biggest difference. It was also the school Jeremy Paxman visited when he did his “Who Do you Think You Are?” family tree. His great grandfather John McKay was janitor there at one point. Unfortunately couldn’t attend Loch’s official opening this week, but it too sounded great – loved the mementoes they gave out made by the children with pictures of the school – keyrings etc. At that point I was in a meeting learning about my primary staffing remit – I think I may need to buy a huge calculator for this bit!! Said goodbye to several colleagues on Friday who are leaving the council and who have been committed to education for many years between them, its sad to see them go but it was fantastic to hear about just a few of the pieces of work they had undertaken which have made a difference to the lives of many children and families – whether as heads, when they were education officers, managers, advisors etc. SLC hold an annual parents as partners conference. This session’s was held on Monday. It was well attended with parent forum and council reps from across the authority’s establishments. The key themes were Curriculum for Excellence and where we are in SLC – with talks from the Depute Director and also from a secondary Head who told the story of his school’s journey with CfE. There was a workshop session when those attending looked at possible new CfE reporting to parent formats, adding their thoughts to this development process. Great singing from John Ogilvie High pupils added a special touch to the evening. 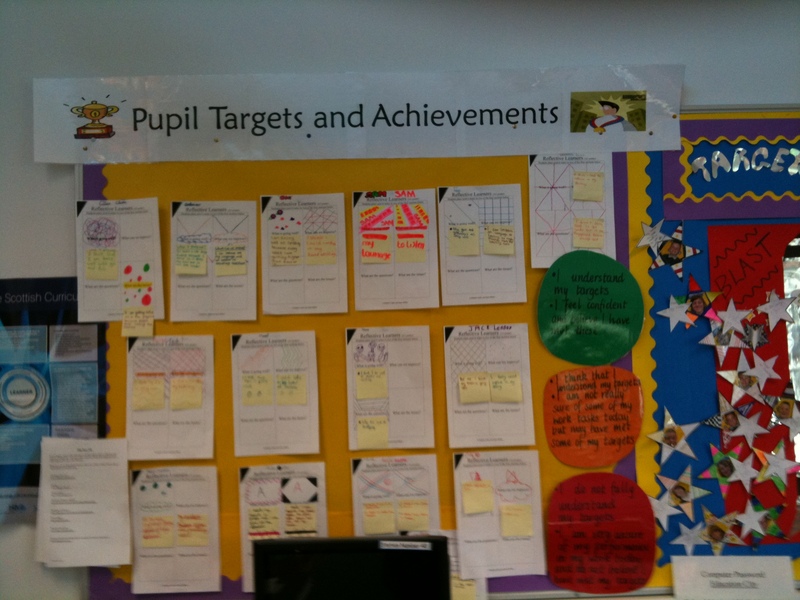 Some really nice ideas seen when visiting Calderwood Primary. 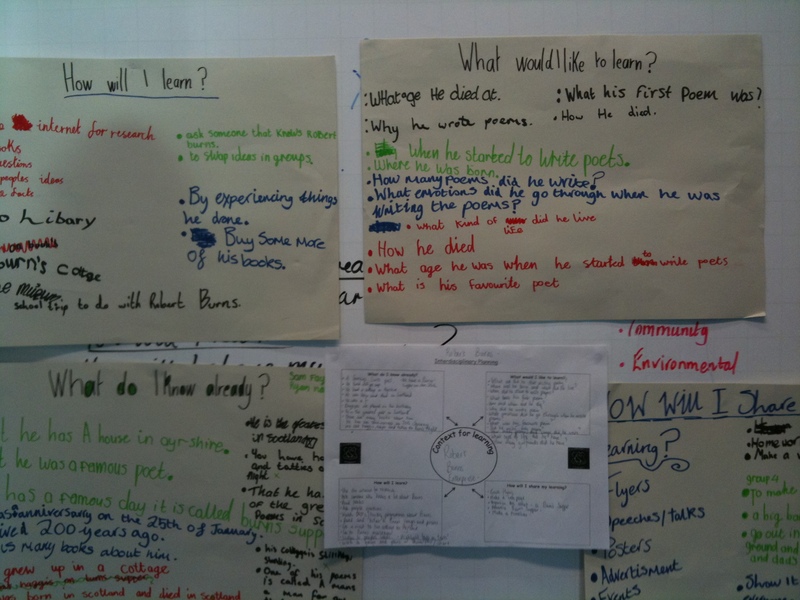 Great example of planning an interdisciplinary topic from P6 below. Classes are working on developing CfE via interdisc topics. They have done a similar piece of work to our early years forum who are in the midst of breaking down the key elements of a focus/topic planner. If the key elements are right then the paper planner will follow. But its the getting right of all the steps within planning first that important. 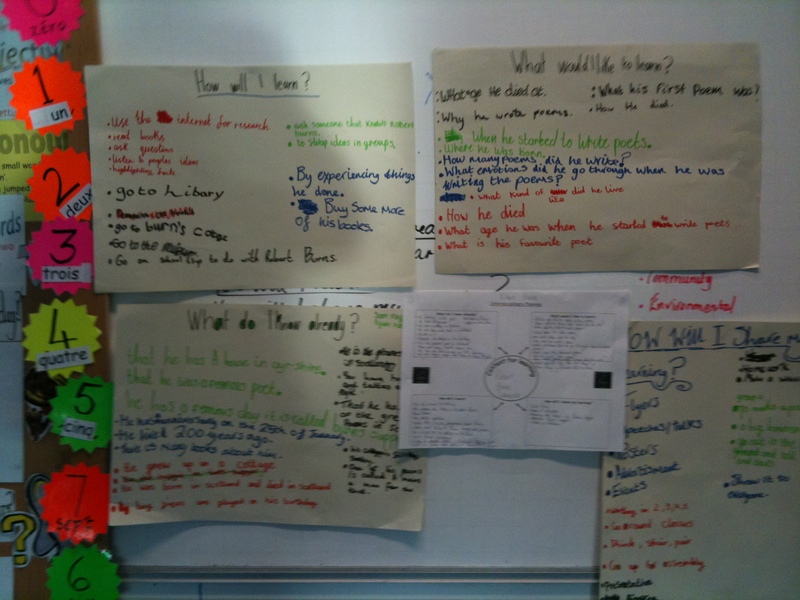 This primary 6 example shows great work on consulting with children. 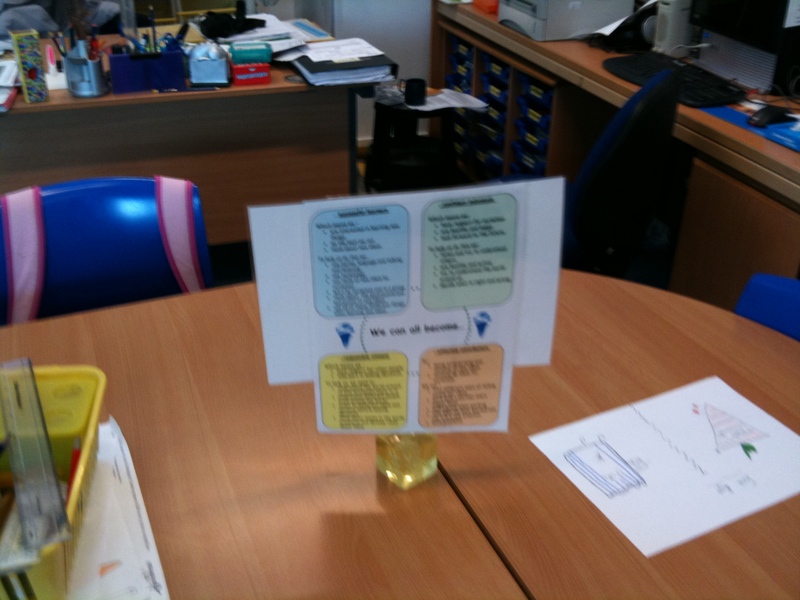 Question Cards Question Starters – these could be cut out and laminated for all staff. What do you know about….? Can you find out about…? Can you give a reason for/explain….? What would you have done…? What do you think will happen/would have happened next…? What makes you think….? What would you use for….? Why is …. an example of….? How could ….. be improved….? How could this….be made even better? How would you deal with….? What would be an example of…? Can you explain in your own words…? What is the main idea of…? Can you work out the parts/structure/bits of….? How can you show the differences/similarities of….? What patterns can you find….? What can you tell about…. Because of….? What is important/not important about….? Why would someone else think that….? What would you say to a person who said…? What are some of the problems….? What do you think of….? What makes…. great/good/not so good? What went well/didn’t go well…..? What did you find out….? What us the most important….? Do you agree or disagree with….why? If you could change one thing about….what would it be? What are the strengths and weaknesses of….? Generating new ideas, products, or ways of viewing things – Designing, constructing, planning, producing, inventing. Can you think of a better way to….? What would you have done if….? How would you do this better next time…? How would you change this… to…? Could you invent/design a new way to….? What could you do to improve….? What would you sort out/take away….? Are there any ways you could….? How many ways could you….? How would you find out….? Jaye Richards was sharing the results from her Glow work with her S3 biology class with me, and the resulting attainment rise is extremely impressive. Seeing her collation of results etc just confirms the importance of this kind of careful reflection on impact. We need to be doing much more of this within our classrooms to ensure we get off the hamster wheel of development for development sake and ensure that we use our resources for improvements which are carefully considered. I noticed she was discussing how innovation fatigue can set in within schools and I think its really important that the kind of work she has been doing is seen as a model which others can try, albeit perhaps on a smaller scale – practice where practitioners are focused on the improvement they are trying to achieve and carefully considering whether or not there has been an impact. I’ve been pestering various people with her results because I feel something as significant and well researched as this should be looked at seriously. The next question to ask is – is it the ICT and GLOW which is making the difference here or the one I suspect is more likely… is it the methodologies she is trying out as she teaches because the tools she is using are helping her try innovative teaching? The other thing in amongst this is the amount of time Jaye is spending networking, researching etc via online communities and how much impact that is having on her practice in the classroom. 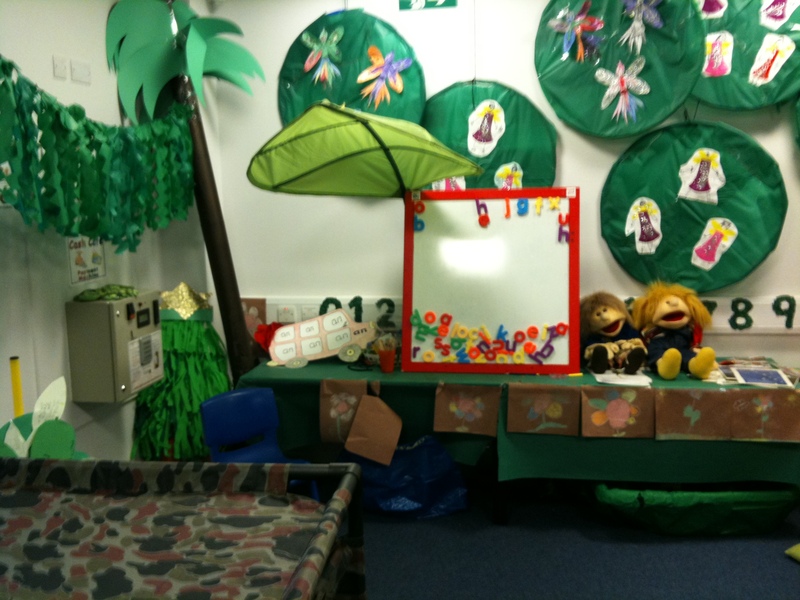 Meanwhile out in the nurseries I had a ball in Westburn Nursery the other day where they had made an indoor beach (just glad I wasn’t having to clean up later), it was great fun for the children. The whole nursery was looking vibrant and interesting – I had to go to the toilet for hankies as I get very sniffly when things are going so well! 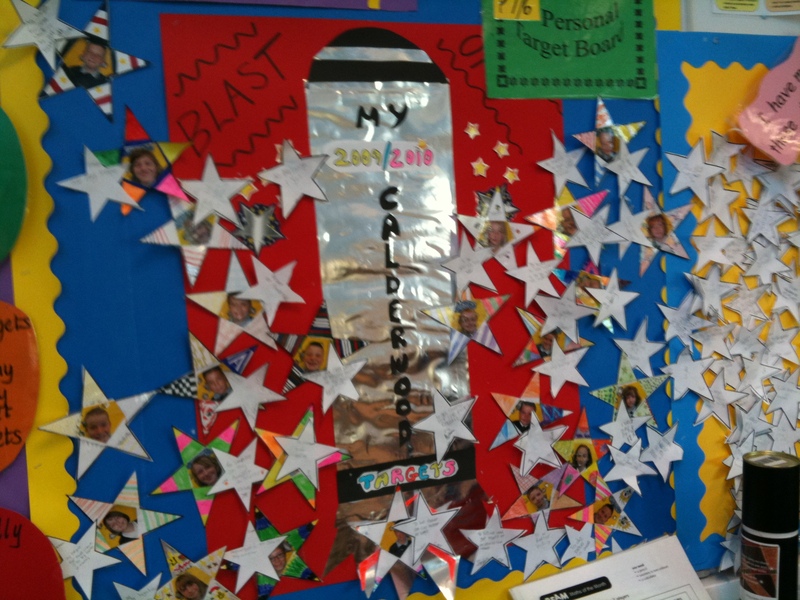 At Loch Primary today I was really impressed in a QIO quality kind of way! The Head has set up a new colour coded filing system with the HGIOS colours and QIs for evidence gathering for HMIe. I took a picture but saw the look of horror on her face as I snapped away.It may be odd that I could be so excited by her new filing system…. It was pretty damned impressive though!